Despite contentions that nothing less than 2.5-litres of engine could hope to enjoy success in the Tasman Championship, the decision of BRM to send out a full factory team and use the now obsolescent Formula I cars with their V8 engines stretched to 1916cc was vindicated in no uncertain manner during this season. Between them, drivers Graham Hill, Jackie Stewart and Richard Attwood won seven of the eight races and Stewart, who raced the full series, carried away the title. It was the 1965 Tasman champion Jim Clark who broke the BRM sequence by bringing home his 2.5 Lotus-Climax in first place at Warwick Farm. 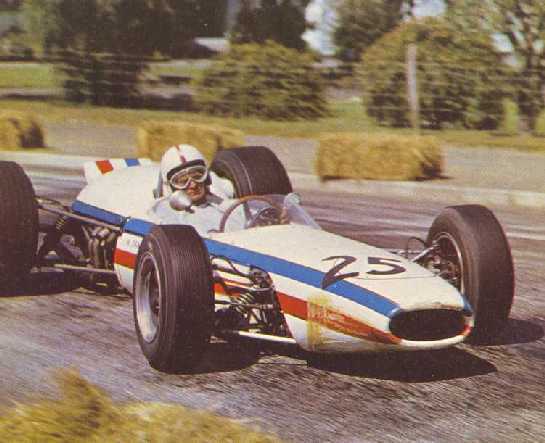 Hill, who won the 1965 New Zealand Grand Prix, made it a 'double' to give BRM its first victory in this race and went on to win the Australian Grand Prix at Lakeside. Stewart's title winning run comprised the Lady Wigram Trophy, Teretonga International, Exide International at Sandown Park and South Pacific Championship at Longford. Attwood secured a last-minute decision in the Gold Leaf International at Levin. Hill on his way to winning the NZ Grand Prix. The remarkable feature of it all was that the two BRMs finished thirteen times in sixteen starts including eleven times in first or second places. The reliability of the cars was phenomenal. Stewart retired with transmission troubles at Levin and Lakeside, while Attwood was unfortunate to be involved in the opening lap melee at Teretonga. So much for the gloomy forecasts that the high-revving V8s with their six-speed gearboxes would be left breathless, except on the one or two comparatively fast circuits. In point of fact, there was only one engine failure in the BRM camp during the series. This was Attwood's machine during training for the Teretonga race. Moreover, the theory that the BRMs would be at a disadvantage, because of the narrow top-end torque range, was quashed at Teretonga when Stewart motored out the last fifteen or so laps on the tight circuit with third gear the only operable ratio left in the box. Last minute preparations for the start of the thirteenth NZ Grand Prix at Pukekohe. The Tasman Formula, with its 2.5-litre limit, was originally introduced to give New Zealand and Australian drivers a chance of competing on reasonably favourable terms with men from further afield. At that time thinking centred around the four-cylinder Coventry Climax engine. Now the smaller BRM V8 has demolished any ideas about economy and local chances, and it is worth noting that the Bourne team saw fit to use its Tasman Formula cars for the first round of this year's World title series at Monaco. The results speak for themselves: Stewart first, Hill third and American Bob Bondurant fourth in a privately-entered car. While the overwhelming superiority of the BRMs robbed the series of much interest, it must be conceded that the New Zealand promoters were rather unlucky. John Surtees had been engaged to drive a factory-entered V6 Tasman Formula Ferrari, but his near-to-death crash at Mosport some months earlier led to the withdrawal of the Italian entry. In New Zealand one incident in each race, with the exception of Levin, took the sting out of the contests. Jim Clark had two of the most unhappy months of his international racing career. The dice were loaded against him. Team Lotus chief Colin Chapman switched from Dunlop to Firestone tyres only days before the opening of the series. After a year of intensive development, following Bruce McLaren's New Zealand debut with the American tyres, there was probably not much wrong with the rubber, but an almost unbroken sequence of misfortunes robbed the Flying Scot of all chance of sorting out the Lotus fitted with new boots, the abortive race at Pukekohe, no practice at Levin and none again at Wigram, where he was in the race itself for only four laps. At Teretonga, where he finally had some real practice, he was in good form on race day and held off Stewart to win his heat. Then he drew away from the other Scotsman in the main race only to go out when in quite a commanding situation after ten laps. The Warwick Farm win augured well for a change in fortune in Australia. He took third at Lakeside, but ran pointless races at Sandown and Longford and finished up third on the ladder with twenty-five points to the forty-two of Stewart and thirty of Hill. Leo Geoghegan (Lotus 32) in action at Pukekohe. Frank Gardner, driving the Alec Mildren 2.5 Brabham-Climax, was no luckier. Eliminated at the start at Pukekohe, he appeared to have Levin in his pocket until a transmission spider broke a finger two laps from home. At Wigram he ran out of brakes on the fourth lap and took Clark with him at the hairpin. At Teretonga he was only 18 sec behind Stewart when the BRM gearbox started to play up. He might have made up the leeway and won but for temperamental brakes. In the hotter Australian competition he fared rather better with a third at Warwick Farm, a second at Lakeside and sixth spots at Sandown and Longford. Gardner finished fifth in the series with eighteen points, three behind reigning New Zealand champion, Jim Palmer, but comfortably clear of young Spencer Martin, the only other Australian to race the full series. Martin had the seat in Scuderia Veloce's Brabham-Climax BT11, the car in which Hill had won at Pukekohe the previous year. A young driver who had made quite an impression in Australia, Martin had occasional lapses in the course of his first international sortie. He skated out of the Grand Prix in the first lap after leading briefly, then redeemed himself to some extent by finishing fourth at Levin and Wigram. In the latter race he matched his ability against Palmer and came off second best. Teretonga saw him out in the rough at the first-lap pile-up. With a little more restraint, Martin might have made more of an impression for he probably had more training than anyone else as he also raced the team's 250LM Ferrari at each meeting. Once again, Palmer was fastest resident driver on most circuits in New Zealand and he was most consistent in Australia, finishing well in the running in each event. He had the 2.5 Lotus-Climax 32B that Clark had used in 1965 and, as usual, he turned on polished performances, racing to finish as far up the field as possible. He could generally head off his New Zealand adversaries, as well as the bulk of the Australians, but had to bow to the experience and superior equipment of the drivers from Europe. It was only at Levin (a circuit he dislikes) that Palmer was headed by a fellow countryman. Roly Levis, the current 1.5-litre champion, beat him into fourth place with the Brabham-Ford, showing that he had retained the peak form he attained in the 1965 season. For all that, Levis did not have a particularly happy season in international races. But time and again he turned in qualifying lap times with his 1.5 car that overshadowed those of the majority of New Zealand 2.5 drivers. Dennis Marwood admirably filled the berth in the Ecurie Rothmans 2.5 Cooper-Climax and, for a first season in international company, made a good showing, driving consistently and steadily. 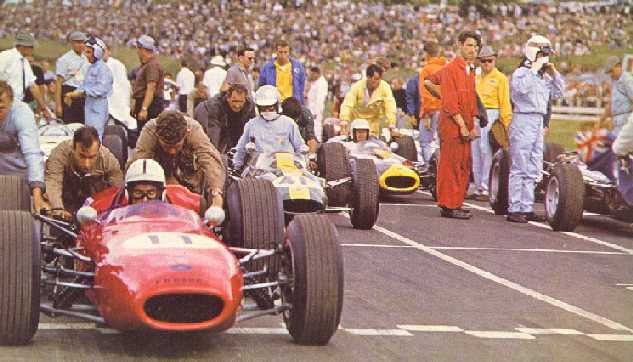 Andy Buchanan, who had made a promising start in single-seater cars two seasons previously but slipped a little in 1965, raced the ex-Palmer 2.5 Brabham-Climax in New Zealand and Australia without marked success. Red Dawson contested the series in the ex-Matich Brabham. The 1966 season has clearly demonstrated that the Tasman Formula has not outlived its usefulness. The BRM team showed that there is room for variety and the New Zealand and Australian Internationals are no longer the exclusive province of the 2.5-litre, four-cylinder Coventry Climax engine. The Australian driver and constructor Jack Brabham has a competitive engine in the Oldsmobile-based V8 Repco, and Enzo Ferrari's Tasman Formula car with V6 engine would certainly be a match for anything likely to contest the next series.